Innovador termogénico libre de estimulantes. Ofrece unos buenos resultados. Utiliza diferentes vías. Why. A revolutionary approach to fat loss, Assass1nate works via multiple fat burning pathways to increase fat loss without the need of stimulants. It does this by improving nutrient utilisation efficiency, enhancing thermogenesis, and also targeting PPAR and other receptors. In short, if you want a change from a bog-standard fat burner based around boring ingredients, give this one a go and for even better results, add a thermogenic stimulant based fat burner. When. As with any fat burner keep this for when you are dieting only. Who. Anyone wanting an advanced fat burner without the need for stimulants. - Non-stimulant innovative fat burner. - Innovative fat burner using the latest supplement science. - Targets PPAR-α, PPARγ, CPT1 and Leptin. - Improved performance and muscle pumps. - Better fat loss without the use of stims. Olympus Labs is a brand on a searing pace when it comes to releasing new products and right now we can't think of a single brand that is as hot as them. 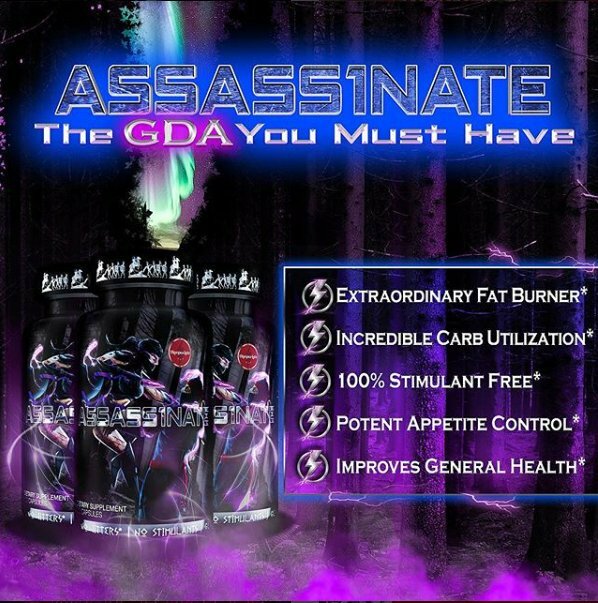 Assass1nate is an unusual kind of product which combines some unusual ingredients that caught our eye and promises to deliver in multiple ways to improve body composition. Let's face it, when it comes to getting lean quickly most of us reach for a stimulant powered fat burner with the likes of Superstim being ever popular for crushing appetite and boosting metabolic rate. However, not everyone wants to use stimulants so it is for these people that Olympus Labs have created Assass1nate by using a non-stimulant formula which still promises to deliver better fat loss for people. 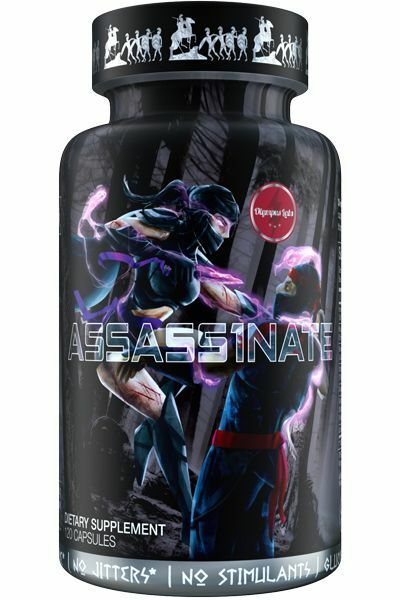 Olympus Labs have formulated Assass1nate in such a way that it lets you utilise the nutrients in food in a better way. It uses dihydromyricetin, trans-tiliroside and carnosic acid which have been included based on their promise in research in stimulating energy output while also improving your body's ability to effectively manage carbohydrate in your diet. It works by acting as an insulin mimetic, an anabolic hormone produced by your body when you eat carbohydrates which helps shuttle nutrients towards muscles leading to increased glycogen content. The second part of the Assass1nate ingredient stack, the likes of olive leaf extract, lutein and orthosiphon stamineus extract target different fat burning mechanisms. This stack works by targeting exotic pathways such as PPAR-α, PPARγ, CPT1 and the one you might have heard of which is more important than the rest put together - Leptin. Leptin is a critical hormone for body composition as it has a modulating effect on just about any hormone involved in burning fat or building muscle. As a result, by delivering carbohydrates to muscles more efficiently, users of Assass1nate can expect to see improved performance over high rep, sustained duration exercise as well as a fuller look to their physique. At the same time, the ability of Assass1nate to improve fat loss via various exotic mechanisms makes this an easier way to get to your desired bodyfat percentage if you prefer to avoid using stimulants. Better still, by stacking Assass1nate with a thermogenic fat burner you can expect to see even quicker progress. Disfruta de este excelente activador termogénico libre de estimulantes en tu tienda online de confianza: "Laproteina.es"
Dihydromyricetin, Trans-Tiliroside, Ácido carnósico 20%, extracto de Orthosiphon Stamineus 70%, extracto de hoja de olivo (estandarizado al 20% de hidroxitirosol), Luteína 20%, Oleoylethanolamide (OEA). Otros ingredientes: celulosa, gelatina, sílice, estearato de magnesio, FD&C azul #1, FD&C rojo #40. Como suplemento dietético para adultos sanos, tomar una cápsula antes de cada comida del día. No exceder la toma de 4 cápsulas en un período de 24 horas.